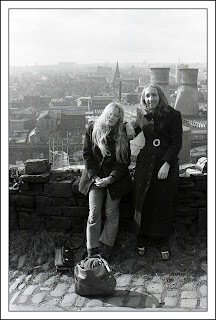 The promised recreation of the 1971 photograph didn't take place against the backdrop of Halifax. Nor could I find a convenient stone wall. But use your imagination : convert a garden tool-shed into a wall, where you see fences and shrubs think of mill chimneys and cooling towers. The two girls are the same. And I for one would say : youth's not over. And following the suggestion of the Silver Fox - a fine fellow I would happily follow most places - here is the original for comparison. I have a feeling that I might have used this photograph before on one of my Blogs, but I make no apology for using it again. It is one of my very favourite photographs of all time. It shows our friend Janie and the GLW (Issy) against the backdrop of industrial Halifax. It dates back forty years and therefore qualifies as a Sepia Saturday shot, and is particularly appropriate as we will be visiting Janie and her husband Edwin this weekend. I will try and find a stone wall and persuade the girls to adopt a similar pose and see what kind of photograph we can come up with. My weekend away is the reason for this early Sepia Saturday submission, but Sepia Saturday contributions from throughout the world will be appearing on the Sepia Saturday Blog throughout the weekend. There was no News From Nowhere post yesterday : blame it on my friend Chrissy. There we were on Tuesday night, the two families enjoying a convivial dinner at the rather splendid Farmers' Boy in Shepley, exchanging conversational gambits. During a momentary lull in the conversation and whilst I was spearing one of their fine hand-cooked chips onto my fork, she lobbed an anti-personnel mine across the table. "How's the book coming along?" Oh, you cruel woman, you appointed agent of the unforgiving muses, you twice-distant cousin of Shakespeare's Dark Lady. The answer, of course, was that it is not : it has not moved forward at all since I returned from my holiday last November. Creativity rapidly evaporated with every step closer I came to the comfort of home, the time-wasting pleasures of over-thick daily newspapers, and the need to catch-up with missed episodes of Coronation Street. But yesterday, with the whip-lash of her comments still raw in my mind, I turned to the manuscript yet again, and attempted to move the ancient hulk forward. I have a significant track-record for starting books that never get finished. There was my "Lives Of The Great Brewers" : a book which was going to rival "The Lives of the Great Saints", but never progressed passed Henry Thrale of Southwark. There was a series of short stories entitled "The Deaf Detective" which would have won a prize any day for being some of the shortest short stories ever produced. Perhaps the nearest I ever got to finishing a book was a project I embarked on fifteen years ago, which never really had a proper title, but was about an investigator working for the Internal Audit Directorate of the European Commission in Brussels. 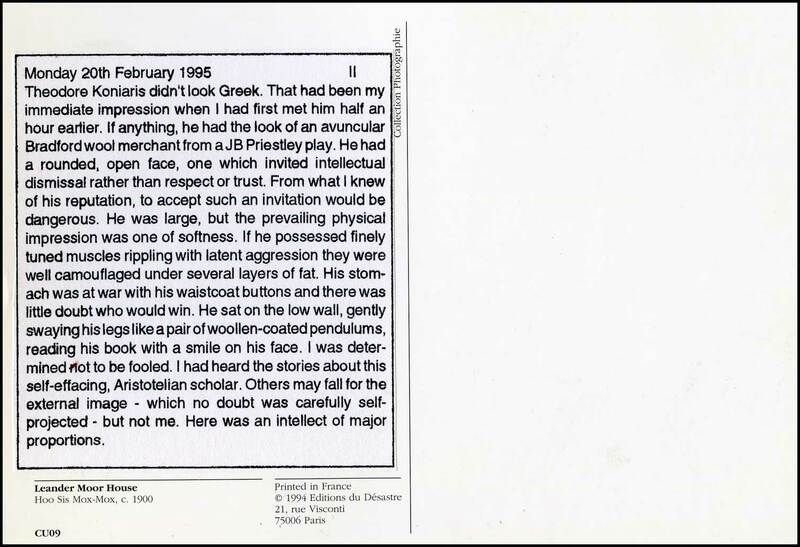 His name was Theodore Koniaris and because he was from Greece, he was known as "Theo The Greek". I approached the writing of this unfinished novel in a quite ridiculous way : I wrote it on the back of a series of picture postcards. I would acquire two identical postcards for each "episode", one I would address and send to my good friend Martin, the other I would keep in a box at home. The approach had three distinct advantages : it ensured you did a little writing every day, the picture side of the postcard provided some measure of prompt for the developing story, and it kept the postman who would deliver the cards to Martin's house amused. 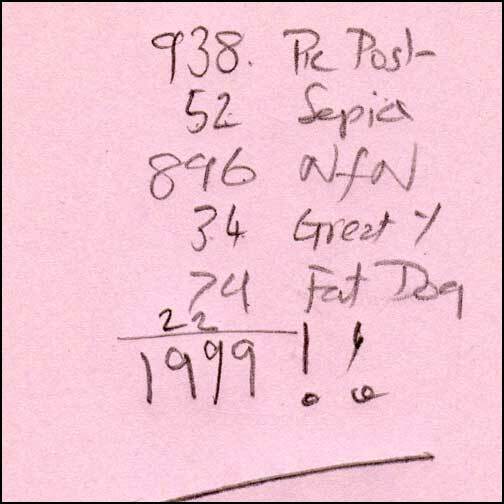 As an illustration of the process, here is the second card which was dated 20th February 1995. 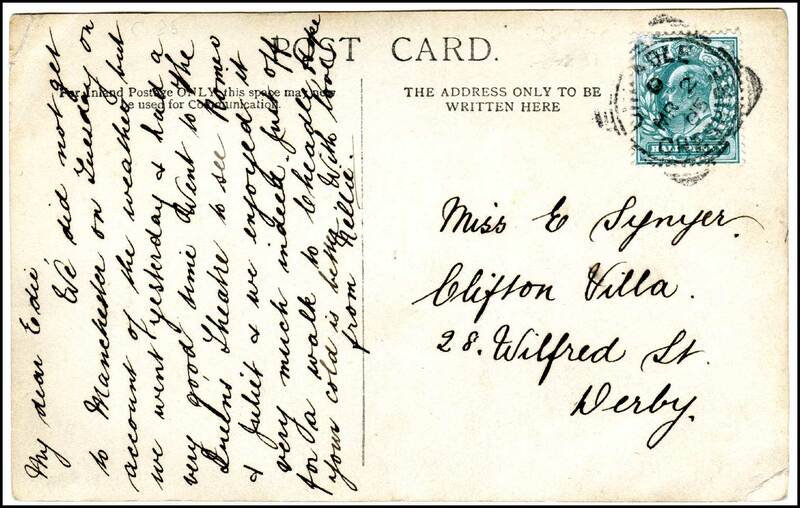 The front of the card is illustrated above, the reverse - with the daily episode but without the address - is reproduced below. In order to kick-start my current unfinished book, perhaps I ought to adopt the same, ridiculous approach. Just around the corner from where I live, used to stand a large house with a substantial garden. And then one day the bulldozers moved in and knocked the house down and dug the garden up. Where once grew Spring tulips, there now grows "units of elegant, bespoke living". Where misty raindrops once dripped from a tennis court net, now cold asphalt pours to form a new road. 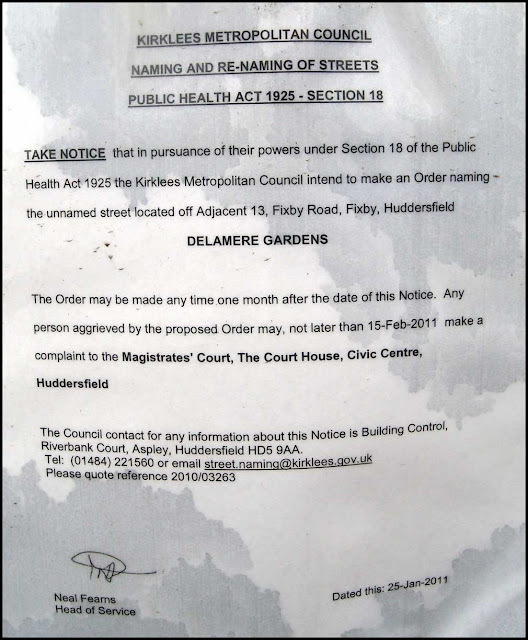 And according to a notice pinned to a lamp-post, that new road will be named Delamere Gardens. The Local Authority want to hear from any person who might be aggrieved by such a proposal. I have missed the deadline, but I will submit my views anyway. I am writing to you with regards to your proposal to name the new road you are planning to built to service the luxury development of 14 bespoke contemporary homes in Fixby, Delamere Gardens. I write not because I am aggrieved by the development itself - merchant bankers must have something to spend their bonuses on, after all - but by the choice of name. "Delamere" is such a meaningless homage to aspirational vacuousness, with no links to the area it has been chosen for. "Gardens" is, if you will pardon the expression, an oxymoron, as it is intended to describe something that used to be a garden and is now little more than a bed of concrete and asphalt. Now I know what you are going to say, so perhaps I can save you the effort. You are going to say that the name of the house that formally occupied this desirable plot of development land was "Delamere" and therefore the name follows a fine tradition. But, I ask you, what kind of tradition is that. The owner of the old house obviously chose a name so that it would sound middle class, middle England, middle everything. If the word Delamere means anything it refers to a wood in Cheshire or is a corruption of the Old English meaning "of the lake". Look around you, we are nowhere near Cheshire and I will give you £10 in Council Tax for every lake you can see. No, if you want the name of the new road to connect to the former owner of the house, why not call it Kagan Gardens (after Lord Kagan who lived there) or Gannex Garden (after the coats that made him is fortune and enabled him to buy the house). Or you could name in Armley Avenue after the prison he spent time in for tax evasion in the 1980s. Perhaps we would be better to forget the history : name it in the contemporary style, in commemoration of the times within which it has been laid out and built up. "Hedge Fund Crescent" has a certain ring to it, as does "Speculation Road". Often, when I am bored, I will start excavating my jacket pockets. Whilst the main pockets might throw up the odd sherbet lemon or discarded tuppenny piece, it is that top outer breast pocket that always seems to provide the most fertile hunting ground. The very fact that it is practically useless for all serious purposes, makes it an ideal repository for life's detritus : and if there is one thing I love, it is life's detritus. 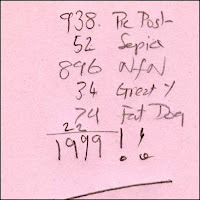 I particularly look forward to finding old bar bills from past holidays so that I can temporarily relieve my boredom by conjuring up memories of not just what pleasurable concoction I consumed, but, with luck, where I consumed it. But it is the odd, tatty, pieces of paper that provide the greatest challenge. As you gaze at the torn corner of a glossy magazine page with some inky numbers scrawled on it, you can try to fathom out what they mean. Was it a telephone number perhaps? Or maybe a mileage calculation. Or could it be the final scientific formula that unites Newtonian physics with quantum mechanics? The dullest of diner parties flash by in a microsecond as you surreptitiously attempt to interpret the paper Rosetta Stone you have been carrying around in your suit jacket for the past two years. My attention being challenged the other evening, I dipped in my pocket and pulled out a torn piece of paper containing a drawing and a few words : which I have scanned and reproduced above. I have no idea from where it originated and by whose hand it was created. Nor have I any idea of its meaning, As such it is an "objet trouve" of pocket art. I share it with you because there seems few things more important to do on a dull and damp Monday morning in February. And I also share it with you in case there is somebody out there who recognises it and who can interpret its inner meaning. Personally, I think it is a splendid piece of art and I am seriously considering printing it on fine art paper and framing it. 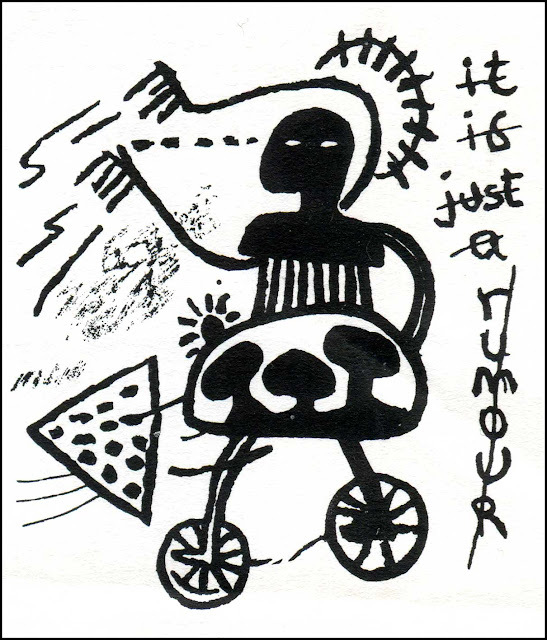 But, there again, that might just be a rumour. So I somehow survived Shopping Week : came out the other side like someone being ejected out of one of those circulating doors you find in the entrances to Department Stores. It has not been all Marks and Spencer's and Debenhams : early on in the week I got the chance to visit one of my favourite Antique Centres where I was able to stock-up on sepias. Let me share a couple of them with you today. 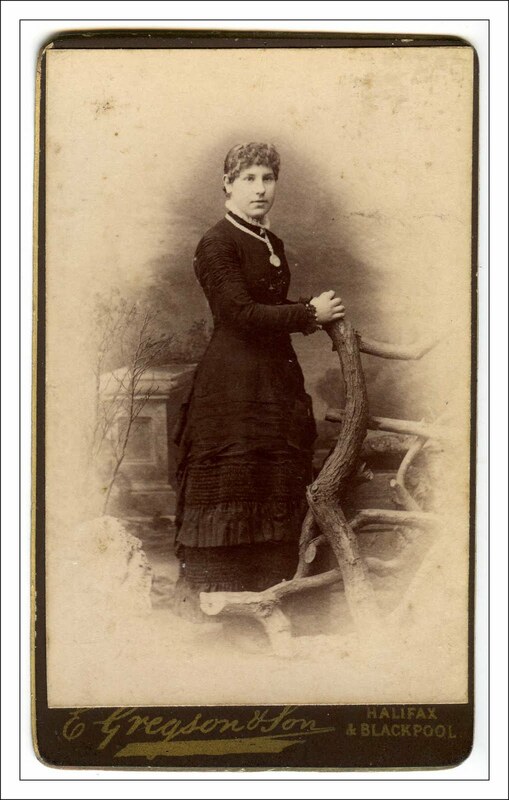 The first is a Victorian CdV showing an unknown Victorian lady and what appears to be half a forest. Victorian photographers were great lovers of studio props and here Edgar Gregson seems to have imported a substantial amount of timber into his Halifax studio, not to mention what looks suspiciously like a sarcophagus in the background. The Lady herself looks like a substantial player on the local Victorian scene : one could half imagine that she might have pulled those branches off the tree herself. 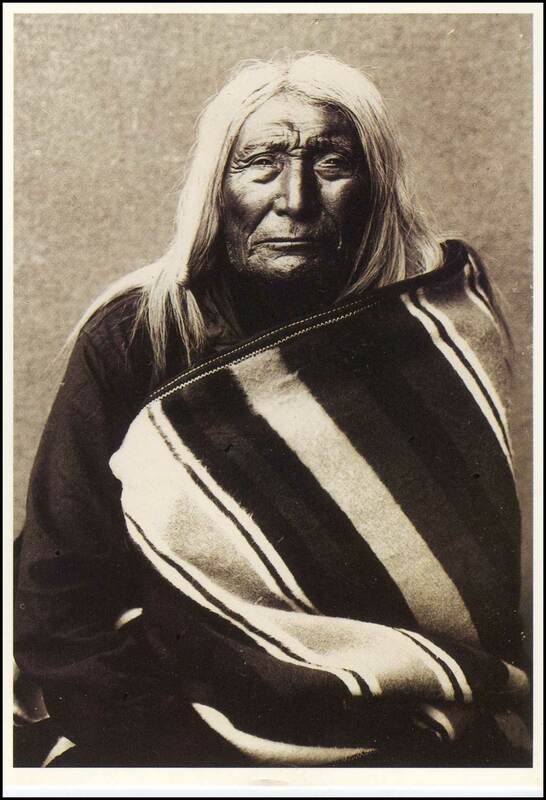 I bought the photograph for a few pence, not because of the imposing subject, but because of the photographer. Although I was born in Bradford, I always think of Halifax as my home town and I had not come across the work of Gregson before. What is surprising is that he had studios in both Halifax and Blackpool : hardly adjacent towns. I have been able to find very little about E Gregson on the internet. The best I have come up with is a 1891 record of an Edgar J Gregson who is listed as a photographers' artist and is living at 201 Gibbet Street in Halifax. In 1891 he is listed as being 23 years of age and unmarried, which means that this portrait of his must be a few years later than this, as by then he comes with son. Having found my first Gregson, I have become a collector of his work and look forward to finding other photographs by him and other branches of his timber props. From a neighboring stall in the Antiques Centre I bought a richly illustrated book entitled "These Tremendous Years 1919-1938" The thing that immediately struck me about the book, which was published in 1938, was that the photographs that make up the majority of the content are all in sepia. There is something fascinating about reading contemporary history 70 years after it was written, before time has a chance to compress events into what later generations see as their relevant historical perspectives. My image is chosen at random. 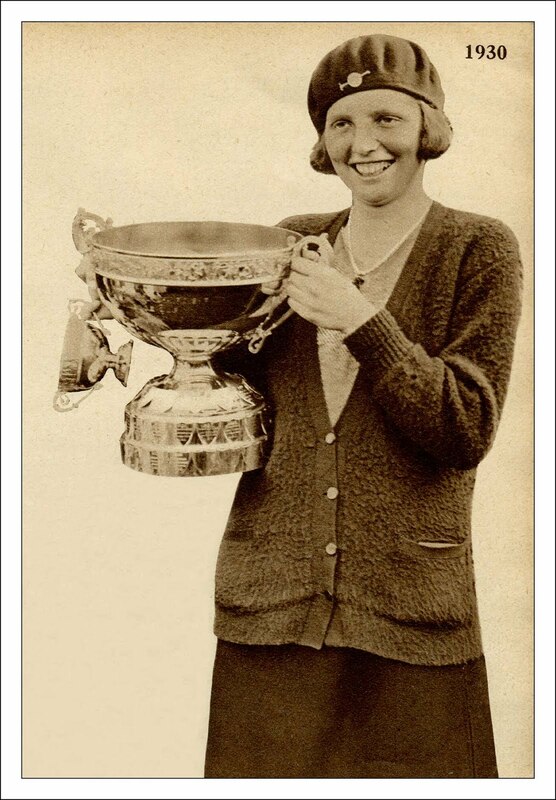 It shows the British golfer Diana Fishwick who in 1930 won the British woman's open golf championship. The caption says : "Diana Fishwick, the 19 year old Broadstairs girl who had never played in a golf championship event before. She defeated Glanna Collett, American champion, and so gained the British women's open golf championships". Again, there is a limited amount of information available about Diana Fishwick. She continued playing golf throughout the 1930s and became the third wife of Brigadier-General Alfred Cecil Critchley, who was a renowned amateur golf champion himself as well as being a highly decorated war hero and the person responsible for introducing greyhound racing to Britain. So there we have them, two random images, united only by the fact that they are both sepia and they both feature women who have held a wood in their hands. And also united by the fact that they constitute my own little souvenir of Shopping Week. Take a look at what everyone else has come up with for their Sepia Saturday contributions this week by following the links on the Sepia Saturday Blog. Who was violently dejobbed in a twinkling by your goodself. For Heavens sake Sir consider this catastrophe as falling on your own head, and remind yourself as walking home at the moon's end of five savage wives and sixteen veracious children with your pocket filled with non-existent £ s d; not a solitudery sixpence; pity my horrible state when being dejobbed and proceeding with a heart and intestines filled with misery to this den of doom; myself did greedily contemplate culpable homicide, but Him who did protect Daniel (poet) safely through the lion's dens will protect his servant in his home of evil. 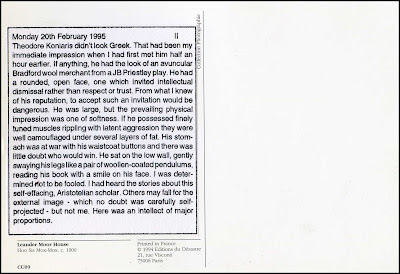 As to reason given by yourself (goodself) esquire for my dejobbment the incrimination was laziness. No Sir. It were impossible that myself who has pitched sixteen infant children into this valley of tears, can have a lazy atom in his mortal frame, and the sudden departure of eleven pounds monthly has left me on the verge of the abyss of destitution and despair. I hope this vision of horror will enrich your dreams this night, and good Angel will meet and pulverise your heart of nether milestone so that you will awaken, and with such alacrity as may be compatable with your personal safety, you will hasten to rejobulate your servant. How I wish that I had written such a letter. 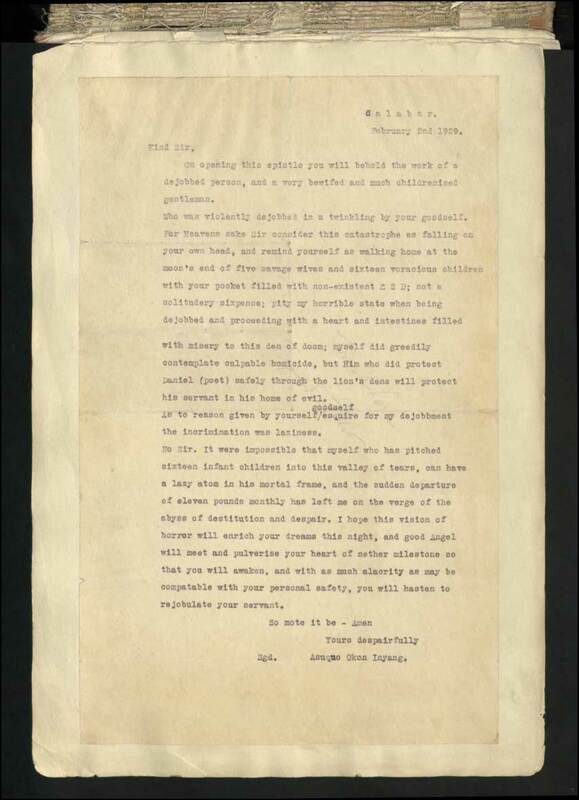 All that can be said is that if Mr Inyang didn't get his job back the British Empire didn't know what it was missing and was a duller place because of it. How strange. This photograph clearly shows my father, but I had to look very carefully indeed before confirming that it was indeed my mother he was standing next to. 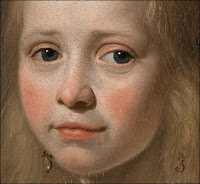 They are obviously both quite young, and it would be another fourteen years or so before I came along, but I had to search long and hard before finding elements of the facial features that I could recognise. 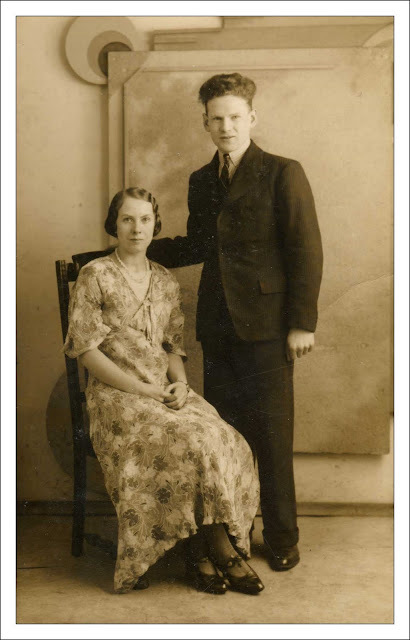 I suspect that the photograph was taken about 1934, when they were both 23 years old, and a couple of years before they got married. Maybe it's because it is a fairly formal photograph or that my mother has a very serious look, but I have difficulty seeing her in this elegant and beautiful young woman. Has anything ever been invented more wonderful than a photograph? 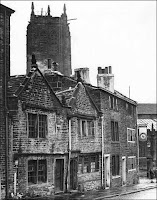 Take a look at some other wonderful old photographs by visiting the Sepia Saturday Blog and following the links you will find there. According to Wikipedia the term "Blog" was first coined in 1999 by combining the words "Web" and "Log". A few on-line diaries and journals existed before that time, but, in the absence of dedicated blogging software, they were time-consuming to update and almost impossible to interact with. I know because in 1998 and 1999 I was helping my brother Roger establish a web-based diary of his day-to-day work as an artist and sculptor and this became a four-year project known as "Sculptor's Diary" (a few extracts of which can still be found on his website). 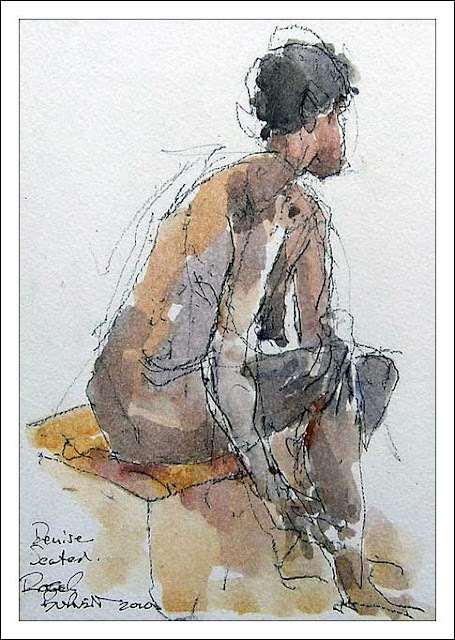 Blogging has become a lot easier in the twelve years since he launched his first "Blog" and I am pleased to report that he has, at long last, launched a new Blog which describes the day-to-day work of a painter and sculptor living on the beautiful Caribbean island of Dominica. In addition to charting his work as an artist, the blog - Roger Burnett's Sculpture Studio - will also follow the work of his wife Denise in her two and a half acre tropical garden. Welcome back to blogging, Roger. Regular readers will know that I tend to get sidetracked. I can set off to Huddersfield and finish up in Wakefield, both literally and metaphorically. I have managed to get sidetracked so many times this week that I have actually forgotten what I set out to do. I remember going to Bradford Library yesterday and getting sidetracked by their old newspaper collection. Today I have managed to get myself sidetracked by skinny-dipping in the National Archives (figuratively speaking). I have now abandoned all plans and objectives for the rest of the week and declared it National Sidetracked Week. Now, where was I before I got sidetracked by being sidetracked? Ah yes, skinny-dipping in the National Archives. 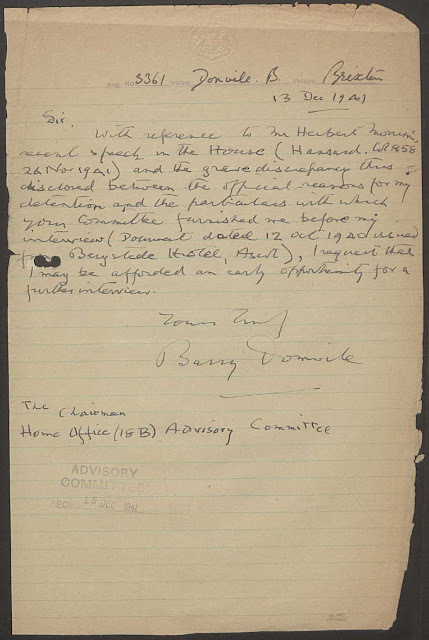 For no particular reason I downloaded the files relating to the appeal by Admiral Sir Barry Domvile against his internment during the Second World War. What I really love about on-line archives is seeing the original document (or the scans of them) : the scrawled handwriting on prison notepaper, the layer upon layer of official stamps, the torn and creased notepaper. Together they somehow breathe life into history. Not that I want to foster any great sympathy for Domvile who, it would appear from reading the files, was a unrepentant fascist and anti-Semite. One of the main reasons for his interment - in addition to his friendship with and support for Hitler and the other leaders of the Third Reich - was the fact that he had set up an organisation called "The Link" in the late 1930s to encourage Anglo-German friendship. The organisation came under investigation by MI5 and was closed down in 1939 shortly after the outbreak of the War. However in 1940 it was resurrected by a young MI5 officer in order to try and lure prominent Germans into the hands of British Intelligence. Some claim that it was this particular ruse that was behind the flight to Britain by the Deputy Fuhrer, Rudolph Hess. And the name of the young MI5 officer? Why none other than Ian Fleming who, after the war, went on to write the James Bond books. Now that is a story worth getting sidetracked for. I seem to have spent much of the day reading old newspapers, first of all in the uncomfortable setting of Bradford Local History Library and more recently on-line via the excellent British Library 19th Century Newspaper Database. I came across the following story whilst I was looking for something else and I thought I would share it with you. It comes from the Keighley News of the 29th July 1911. 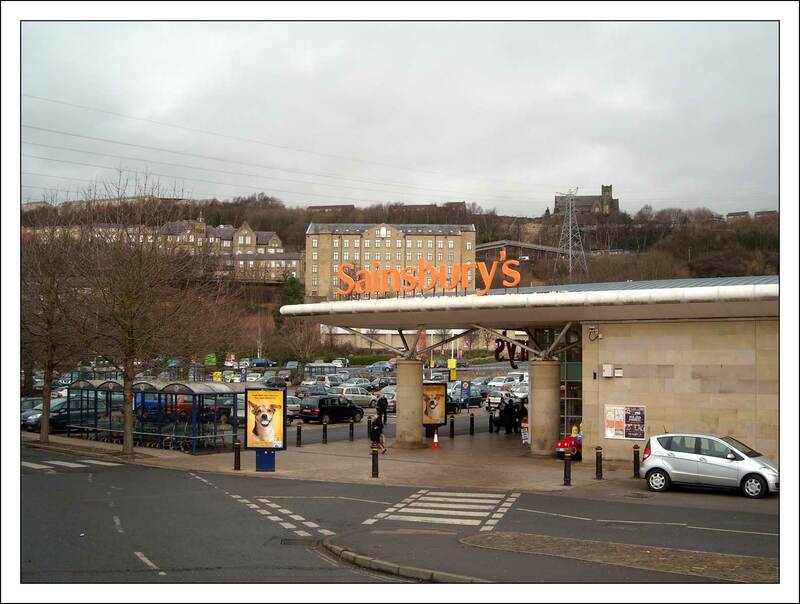 At Bradford City Police Court on Tuesday, Harry Bennett (14) of 25 Osborne Street and John Taylor (13) of 117 College Road were charged in three cases with housebreaking and stealing jewelery and money to the total of £28. Bennett's mother gave him good character, but Taylors' father said he had previously taken money belonging to his sister. In reply to the charges, Taylor said, "It's them picturedromes that spoiled me. I've seen it done. When we first went in we broke a window and went in". 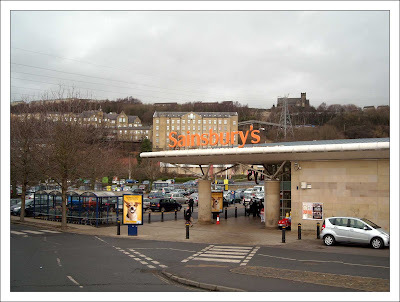 He mentioned several Bradford picture places he had visited. Bennett, who cried during the proceedings, remarked to the magistrates, "Please Sir, I am as bad as him (Taylor)". 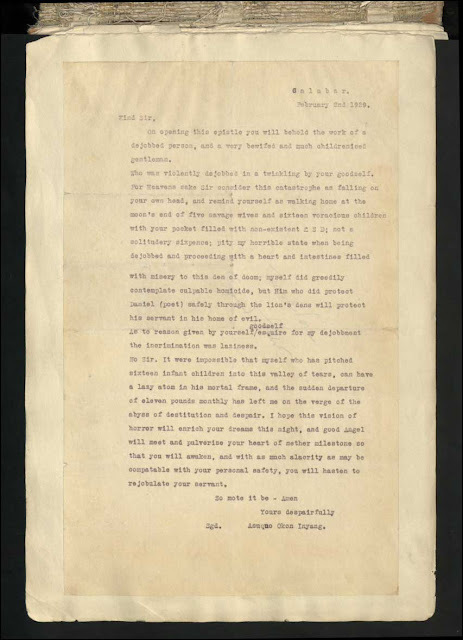 Taylor was ordered to be sent to a Reformatory, and Bennett was bound over for two years. ART : Google's new Art Project is a welcome attempt to make a number of high resolution works of art available to anyone who wants to look at them without the interference of either annoying copyright stamps or demands to pay inflated fees. The site works in one of two ways : you can either take a virtual tour of a number of world-class art galleries using the kind of click and follow technology used on StreetView, or you can look at individual paintings and zoom-in to appreciate amazing detail. The walk-through approach of the virtual tours can be a little annoying, at times it is a bit like walking through an art gallery with misted-up spectacles, but the ability to view individual paintings in almost limitless detail is fantastic. If you have not given it a try yet, do so. (The image is a detail from "Portrait of a Girl in Blue" by Johannes Cornelisz Verspronck). 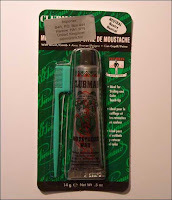 WAX : I am pleased to report that the moustache styling wax has arrived and I am almost ready to start training my appendage. However, first I need to lose some weight as it has been pointed out to me that a curly tash at the moment would make me look more like the Laughing Cavalier rather than Errol Flynn. The diet is a depressing yet necessary move as if I attempt to go on holiday in my current state I would need to buy a new dinner suit. And I am assured that the United States is a nation of slim, healthy and active people and therefore I don't want to appear out of place. So whilst my moustache expands I am hoping that my waste will contract in inverse proportions. 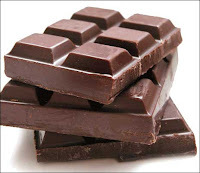 FINE CHOCOLATE : My proposed healthy diet has been helped no end by reading a report in the newspaper this morning about new research into the benefits of chocolate. Scientists have discovered, the report states, that chocolate contains, gram-for-gram, more beneficial plant compounds, and more antioxidants than fruit. So I can ditch all those boring bananas and tasteless apples and break open a bar of Cadbury's Bournville. I need to make a rapid start on my new chocolate diet, before my moustache gets too large. : it wouldn't be befitting the image to have chocolate stuck to your moustache. Ernest George Harcourt Williams (1880-1957) was a British actor and producer famous for his interpretations of Shakespeare. 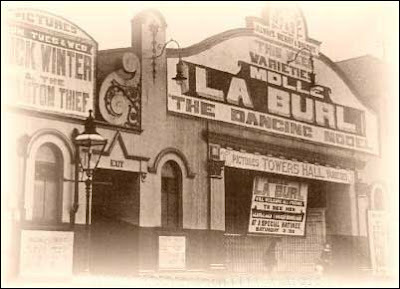 He first appeared on stage in 1900 as a member of the Frank Benson Theatre Company and later in his career he became a producer at the London Old Vic Theatre. Towards the end of his life he made himself quite a name as a film actor appearing in films such as the 1944 Olivier version of Henry V, Brighton Rock, Roman Holiday and Around The World in 80 Days. 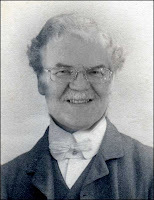 But my vicarious brush with Harcourt Williams occurred many years earlier and came via Edith Synyer's friend, Nellie. Nellie was on holiday in Cheadle, just south of Manchester. 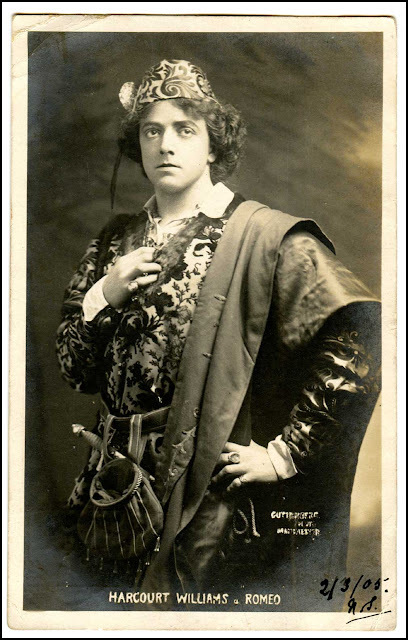 One day Nellie took a trip into the city to the Queen's Theatre to see Harcourt Williams in Romeo and Juliet and was obviously so impressed with his performance that she bought a picture postcard of him and sent it to Edith. It is not the most exciting story in the world : it is quite ordinary. But the real beauty of old postcards and old photographs is the insight they give us into the ordinary : an ordinary which is so often hidden by the glare of all those important historical events. See the ordinary made extraordinary in Sepia Saturday posts from all over the world by following the links on the Sepia Saturday Blog. 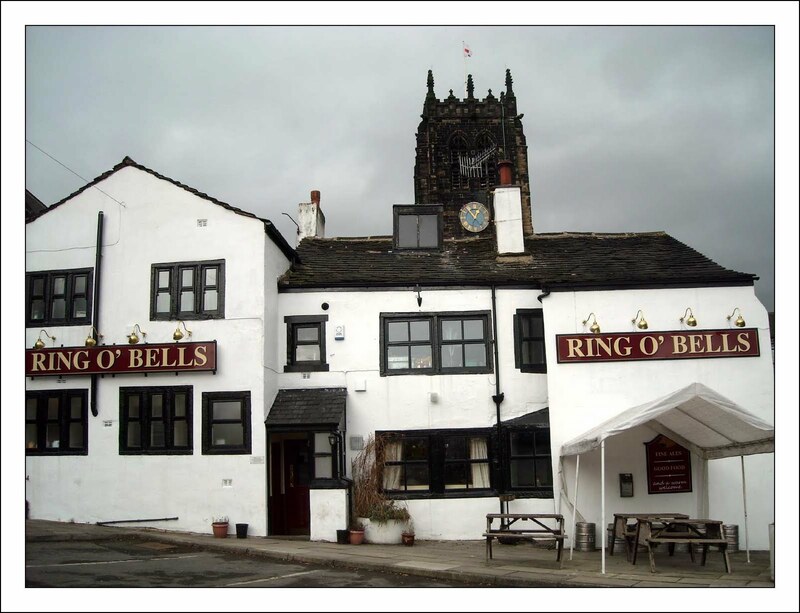 Called in for a lunch-time drink at the Ring O'Bells in Halifax yesterday. Sat in that old eighteenth century inn - there is said to have been an inn on the site from the fifteenth century - enjoying a pint of Barnsley Bitter and leisurely reading the morning paper I felt at peace with the world. 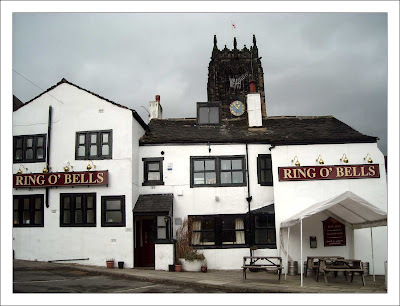 The Ring O'Bells stands at the gate of what used to be Halifax Parish Church and is now Halifax Minister (how it received its ecclesiastical promotion, I know not). The current building, which was originally known as the Sign Of The Church, dates from 1720. Until the last century it formed part of a ramshackle collection of tenements and back-to-back houses, but redevelopment stripped it of its neighbours and left it with a rather inside-out look to it. It is supposed to have a resident ghost called Walt or Wally, but I saw no sign of him unless it was that odd chap with a Tesco bag full of old rags sat at the end of my table. The West Yorkshire Paranormal Group did an investigation of the ghost last year and conducted an extensive interview with him, but if you believe that you will believe that Anheuser-Busch brew a decent pint of beer. My feeling of being at peace with the world was slightly disturbed when I started reading the quotations and homilies pinned to the walls. These were hand-written on blackboards and designed to increase the ambiance and feel-good factor. One, for example, stated "Reality is an illusion caused by a lack of alcohol", which was mildly amusing but hardly original. Another stated "When I read about the dangers of drinking I gave up reading". It was the third notice which caused me to drink up my pint rather quickly and make a swift exit. The signs were written in a kind of mock handwriting and it wasn't always possible to distinguish individual letters. In particular, it was all too easy to confuse a "w" for a "ur". The off-putting sign declared (I think) "I cook with wine, sometimes I even add it to the food". My grandfather, Enoch, had two jobs : during the summer months he was a window cleaner and during the winter months he transformed himself into a watch and clock repairer. This eminently sensible reaction to the changing seasons has always appealed to me, and, in my own little way, I try to follow his lead. Thus during the Spring, Summer and Autumn months I try to take photographs, and during the Winter months I scan my 40 year old black and white negatives and transform them into digital images. The one thing you tend to notice when you scan random old negatives is that the thing which captures your twenty-first century interest is not necessarily the same thing that dominated your 1960s or 1970s viewpoint. Pictures of over-photographed people and over-snapped beauty spots pale into insignificance beside the classic 1960s Ford Cortina parked down the street or the torn poster hanging from the billboard. It is the power of the image which, like one of those salt-encrusted trawler nets, captures everything within its compass. An interesting question is "can you anticipate this process?". Can you deliberately take a photograph today which will provide such a wealth of historical detail in thirty or forty years time? I am not sure, but on my way to the pub this lunchtime I took the above photograph. I will return to this photograph in my post of the 2nd February 2051 and let you know the outcome. A couple of months ago, whilst looking at my Blogger Dashboard, I decided to add up all the posts to my various blogs (Blogger does it for individual blogs so it was just a matter of adding the totals together) and I noticed that I was approaching a notable anniversary. I remembered to check again this morning, just in time : this is my 2,000nth blog post. I realise that this is probably the modern equivalent of being skillful at billiards ("the sign of a misspent youth", my father always used to say), but everybody needs a purpose in life. 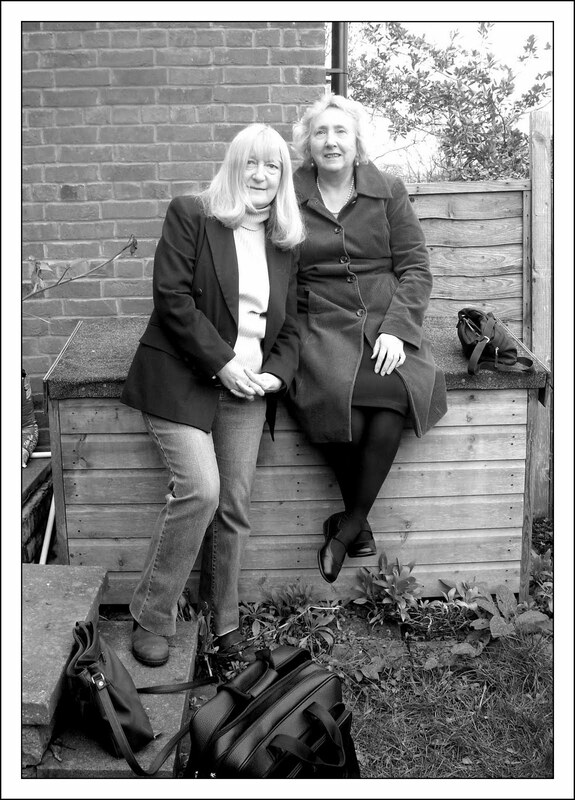 Looking back at my first ever post (back in November 2006) it describes how blogging was a bit of a therapeutic experiment. The short post concludes with the lines : "Perhaps it will become an established part of my life. Perhaps not. Let's just see what happens". 2,000 posts on, I think it has now become an established part of my life. The digital age is truly wonderful and I still find its' ability to broadcast my rather aimless thoughts to people around the world somewhat breathtaking. But I do worry about the transitory nature of the medium. My 2,000 posts might not be earth-shattering, nor are they likely to shine a Pepysian searchlight on the nature of early twenty-first century civilisation, but they mean something to me and I would like to think of any grandchild of mine browsing through my posts in 50 years time. The worry is, of course, that Blogger will be long gone and all those carefully crafted literary gems will have vanished down some cyber culvert heading for obscurity. Paper and print is expensive, inconvenient, and wasteful : but it has a good track record in the survival stakes. That is why I like to gather my posts together every so often and get them published. 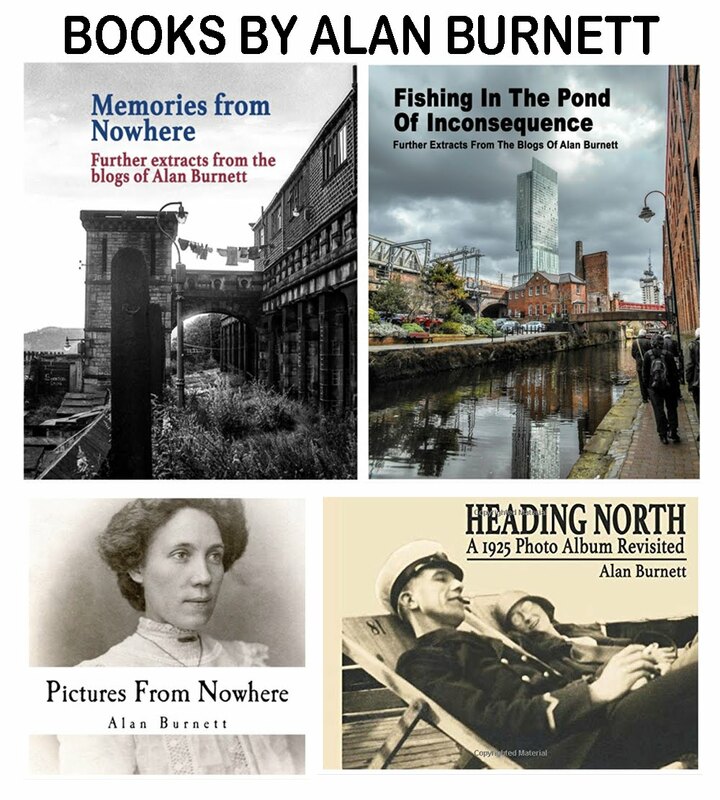 In doing this, I don't intend to sell copies to anyone else, nor become a publishing sensation. Unless there are people with more money than sense out there, I will only ever sell one copy : the one I buy and add to my bookshelf. There are a number of self-publishing services you can use for this. I have used Lulu for many years now and have always been delighted with their service. 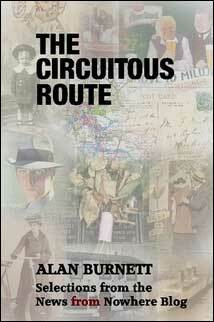 The 180 page volume of my 2010 News from Nowhere posts - called "The Circuitous Route" - was completed last night and cost nothing to prepare. I have bought the one copy I need and it cost me less than £30. It is not a Booker Prize contender, but it is a present for the grandchild that one day I hope to have. Let me finish with a little update. My brother, Roger, has been in touch with some information about the picture - The Speed Boys - I featured the other day. His e-mail says : "The other "Speed Boy" is Colin Fox. He lived just across the road at the bottom of Southmere Drive. On the left, just out the photo, was a fruit and veg shop. Owner was an amateur photographer. The photo was originally displayed in his shop window. He took the photo and wrote the caption on the original. As I remember, Gladys (our mother) bought a print and I suspect copied his title". 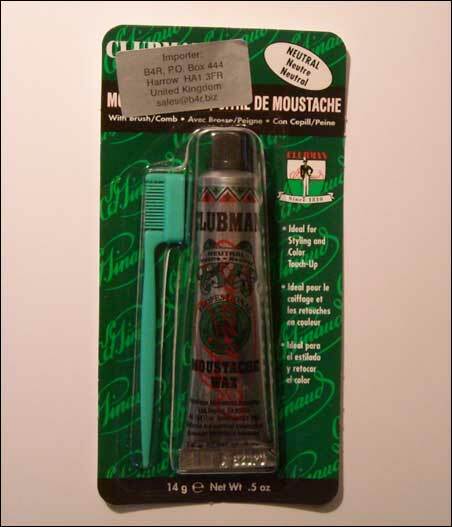 Rog, along with several other people, have given me advice about curling the ends of my moustache and I am pleased to say that I have now ordered a supply of moustache wax from the internet. I will provide an updated photograph once my ends begin to curl. Which seems like a suitable promise to finish with as I head towards my 3,000nth post.